We organised an energy efficiency drop-in session in Port Tennant Community Centre which helped local residents get ready for winter. Although a bad day for weather, and so turn out was low, those who came though the doors benefited greatly from the advice given by the team of experts there. One lucky family won an energy monitor so that they can keep track of the electricity usage in their home and so keep track of their bill too! Thanks to all the partners involved in this event. We have worked in partnership with the City & County of Swansea to raise awareness of real nappies. We've attended two of the local toddler groups (at St. Stephens and at St Thomas Community Centre). Did you know you could save up to £500 by using real nappies instead of disposables and that the council are currently giving away a voucher worth £100 towards the cost of buying them? If you want more information either call Delyth at Sustainable Swansea or the Council's recycling team. A Wise up to Food! workshop took place in late January at Bonymaen Family Centre which informed local people about food miles, local food, food waste and how you can get involved with food projects locally. Lots of useful freebies were available too such as measuring spoons, pasta and rice measurers, fridge thermometer and food container. It was a great session with keen people asking questions and picking up new tips. Display boards with tips and advice about all different aspects of environmental/ sustainability issues have been on show at St Thomas library for two months. It was to compliment a book display on themes such as make your own, grow your own, energy information etc. that the library put together. Don't forget you can also loan out an energy monitor for free to help see what/ how much energy appliances and gadgets use and help with those bills! A Free digital photography taster day took place in mid January where participants learnt the basics about their camera, walked around the area to practice taking shots and then edited and saved them! Also, we helped organise an unwanted household items event where unused, but still in good condition items could be brought to a site free of charge and then given to local re-use projects. 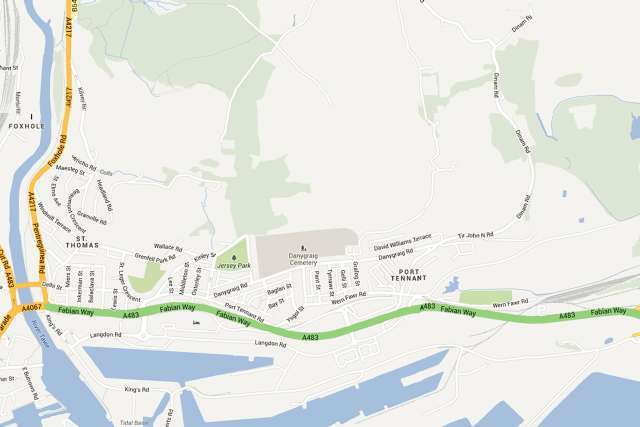 One of the main outcomes of the project is a new Community Green Map for St Thomas and Port Tennant. It shows all the sustainable features of the area and we have been consulting with local groups as much as we can to gain the local knowledge. So keep your eye out for a copy of the map in the community!